Iguazu National Park, with the Falls as its main feature, was added to the World Heritage List for two reasons: its exceptional natural beauty and because it's the habitat of rare and endangered species. The Argentinian side of the park measures 49.200 ha. The adjacent Brazilian side is another World Heritage Site. 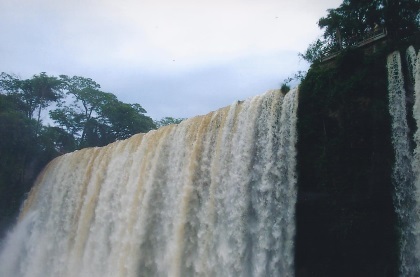 Iguazu is an indigenous (Tupi-Guarani) name, meaning Great Waters. From Foz do Iguacu, I took a public bus to its Argentinian counterpart Puerto Iguazu. From there, another bus brought me to the falls. This side also has some themepark-feeling. I did give in this time, and joined the Great Adventure. That's when you cross the forest by giant car and then jump into a speedboat. The boat takes you up close to the falls, and somewhat underneath. I got terribly wet, and didn't dry until I got back to my hotel in the afternoon and could change clothes. Somehow the falls look smaller from the Argentinian side. However, strolling through the surrounding forest is very worthwhile here. I think I prefer the Brazilian side. 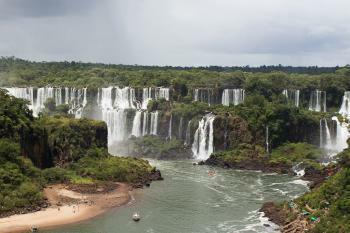 The Argentinian side of Iguazu Falls is nothing short of breathtaking, don’t get me wrong. About 80 per cent of the waterfalls are on the Argentinian side and the paths for visitors take you up close to the action. In fact, you can even take a boat underneath some of the waterfalls which is about as close as you could get (and as wet as you could get too, I can attest!). Standing metres from the cascades lets you experience the power of the water – you can feel the energy coming from it. And nowhere is this more the case than at the very top of Devil’s Throat where a wall of water, larger than you could have imagined, seems to come alive as the torrents plummet down from the river above. Pictures can't do justice to Iguazu Falls -- you have to visit to fully experience the sound, the mist, the utter immensity of these waterfalls. After my visit in March of this year, I am in agreement with most visitors who deem the Brazilian side as the better to view the extent of the waterfalls, and the Argentine side as the better to get up close to the falls. 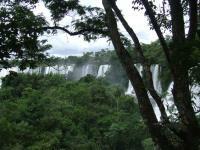 Iguazú National Park in Argentina offers many opportunities to approach the cascades -- whether by trail or by boat. For sheer power, the Devil's Throat waterfalls at the south end of the park should not be missed. From the viewing platforms along the boardwalk visitors can peer right over the edge into the misty abyss separating Argentina and Brazil. Other trails in the middle of the park allow visitors to view waterfalls from above and below, as well as the opportunity to see wildlife such as the ubiquitous coati (do not feed!). 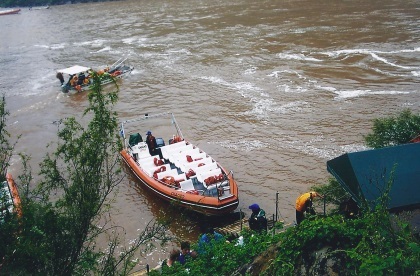 The park also offers a boat tour under the falls, which I thoroughly enjoyed; be prepared to get soaked. Iguazu Falls is an incredible natural wonder, and a memorable World Heritage Site (or two -- ask UNESCO why; it makes no sense to me). Logistics: Iguazú National Park can be reached by frequent buses or by private car from the town of Puerto Iguazú. Even with the border crossing, both sides of the falls can be seen in one day, but it is far better to schedule two days to fully appreciate the falls from Argentina and Brazil. We visited Iguazu Falls last year and I have to say it was one of the most impressive natural sights I have ever seen: far, far more spectacular than Niagara Falls. Most people seemed to prefer the Brazil side (great photos here: www.realworldholidays.co.uk/multi/guide/iguazufalls.aspx) but for me the Argentina side where you get right up close to the Falls was the real highlight. Have to say, unlike with most waterfalls and such like, I would happily re-visit it. 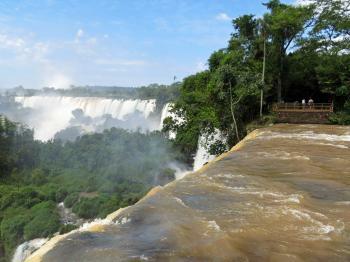 Visited Iguasu Falls both Brazil and Argentina sides in Feb 2011 to compare both. I think both has their own highlights so since you're already there, you should visit both sides to get perspectives of this magnificant falls. Argentina side takes a longer time to reach starting with a long bus ride to reach the entrance, then take the small train into the few stops and then walk almost a km to reach the Devil's Throat which is definitely the highlight. Then u trek back same distance to the train station n continue back to the Upper and Lower Falls area whr you will see countless falls and on a good day numerous rainbows. Anyway personally I would prefer Argentina side due to it's varieties of falls (you name it, you see it) and the upper n lower gives you both perspectives of the falls plus the mother of all falls which is the Devil's Throat. Word of advice: Wear your swimwear and anything waterproof. It's great to run towards a waterfall just above you! After visiting Iguazu Falls, no other waterfalls interest me anymore. with my family on business for 4 years,while we often vitited Foz do Iguazu on a pleasure trip.I was so much impressed with the sizable fine view of waterfalls flowing from Argentine to Brazil.Honestly speaking,I could not find a most suitable word to express such a landscape which I had never seen before.Every time when I visited Iguazu,I enjoyed both sides ,namely Argentina and Brazilian sides. Janeiro's OlympicGames in 2016.That's my dream! As most of the falls are in Argentina, you get to see then up close, so that you are often showered with spray. There are several walking tracks, and a free train service that links the trailheads to the park entrance. From the Cataras station there are the Upper and Lower trails that lead you along the top of the falls, and around the base to reach the (free) boat service to San Martin Island. From the Devil's Throat station you walk out along a causeway to a big horsehoe shaped section of the falls, where the noise of the water is deafening, and clouds of spray come drifting upwards to soak you. This has to be an experience not to be missed. But to complete it you need another half day to cross over to the Brazilian side and see the full panorama from over there. Much better than Niagara, its atmosphere of awesome power still relates to the surroundings, providing proof of forces of nature that once made this planet what it is today. 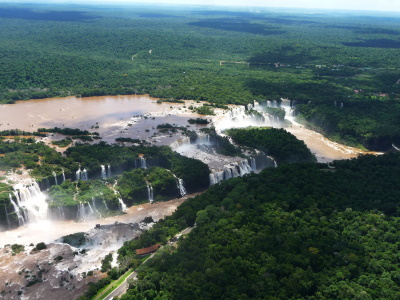 Visual effects of Cloud, Fog and Mist: "The permanent spray from the cataracts forms impressive clouds..."
Recommended for combination by AB: "Brazil's Iguazu National Park is ciearly an integral part of the area and has been included on the tentative list submitted by Brazil. The Committee should request the Brazilian authorities to nominate their contiguous portion of the area and thereby establish an international World Heritage property. "